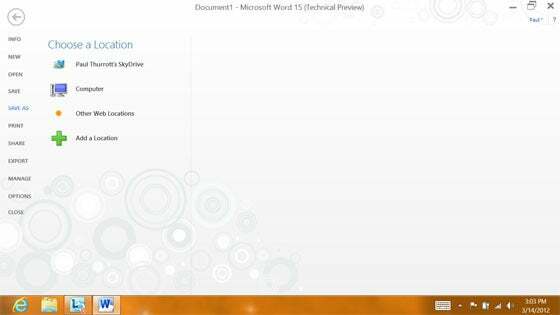 15 Things to Know About "Office 15"
Although the Microsoft Office 15 Technical Preview is a desktop app at heart, it's got Metro running through its veins. That's the main takeaway from Paul Thurrott's extensive overview of the Microsoft Office 15 Technical Preview. The preview is in private beta, with its users bound to a non-disclosure agreement, but Thurrott managed to get a copy of the software and posted lots of screenshots. Still, Office 15 has plenty of Metro flavor, through the use of minimal colors, sharp edges and the same font that runs through the touch-optimized side of Windows 8. The “Ribbon,” a strip of commands first introduced in Office 2007, returns in Office 15, but it's hidden by default, adding to the software's minimalist vibe. The addition of Metro concepts isn't just about aesthetics; Office 15 also tries to introduce some ideas from Windows 8, such as the ability to connect web services such Microsoft's SkyDrive and Yahoo's Flickr. Office 2010 has cloud integration as well, but in Office 15, these web services take more of a central role, with icons for SkyDrive and other Web locations appearing alongside those for the local machine when saving and loading files. Microsoft also tries to accommodate tablet users in the desktop version of Office 15 with a “touch mode” that increases the size of buttons and other elements. 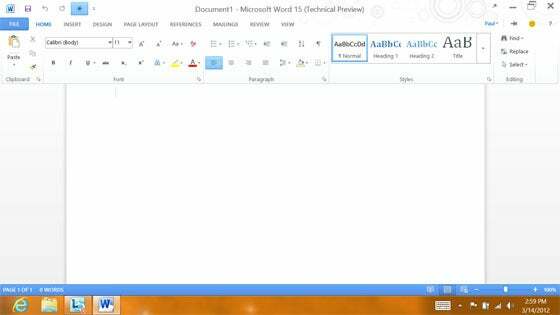 Users can also edit Word documents in full screen mode, which should prove helpful when a software keyboard is covering part of the screen. Thurrott didn't drill too deeply into features, but has lots of screengrabs of the full Office suite, which you can check out at his blog. Officially, Microsoft has said little about Office 15. The company has hinted that it will be a major overhaul, with PJ Hough, vice president of development for Office, calling it “the most ambitious undertaking yet for the Office Division.” Still unknown is whether Microsoft will release a proper Metro-style app as part of Office 15. 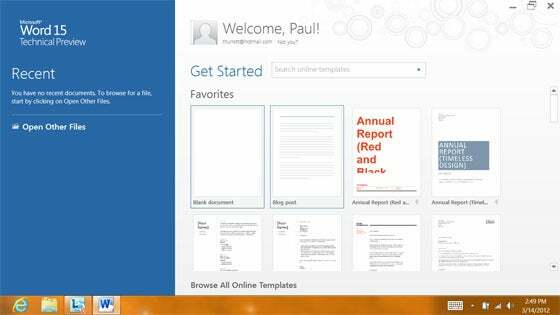 Microsoft also hasn't announced a release date for the final version of Office 15. ZDNet's Mary Jo Foley has reported that the company is trying to finish Office 15 by year end, but the software could slip to 2013. In any case, expect a public beta--and the answers to many more questions revealed--during the summer.